NEW DELHI, India (CNN) -- Cloaked in a traditional flowing red and saffron Tibetan robe the Dalai Lama took a deep breath as he began to express his gratitude to the country that took him in as a refugee 50 years ago. The Dalai Lama says he is grateful for the care and support he has received from India. "I think in this country (there are) many other refugees," the Dalai Lama reflected, sitting cross legged. "But we are I think (the) most fortunate and successful refugee community because of (the) government of India's care and support." His journey to India was a treacherous one. The year was 1959. Tibetans had staged an uprising against Chinese rule and the security forces reacted with force. The Dalai Lama's followers, who consider him a living God -- the latest reincarnation in a long lineage of revered monks -- were worried about his fate under the Chinese. He was, after all, just 23 years old. On March 17 that year, the 14th Dalai Lama fled his homeland on horseback. A half century later, the spiritual leader of the Tibetan people recounted to CNN that day and the subsequent journey to India. "Most fearful sort of moment is... (the) night of 17 March 1959," he said. The Dalai Lama and some of his followers were about to cross a river on horseback when they suddenly realized they were within sight of a Chinese army camp. The fear, amplified by the harsh conditions. The bitter cold and thin air of the Himalayas assaulted their bodies as they slowly made the trek over the mountains. "(We had) practical sort of problem, difficulties. High mountain. If you try to walk then... breathing difficulties, but on horse too much cold," the Dalai Lama said, laughing aloud. "Hand and foot become frozen." The Indian government took in the refugees and helped resettle them. One of the biggest Tibetan towns is Dharamsala, in the mountainous state of Himachal Pradesh. The town has become the headquarters for the Tibetan government in exile. And that's where things begin to get sticky for the Dalai Lama and the Tibetan community. When India took in the exiles, it told the Tibetans to refrain from political activity, certainly of the anti-China kind. But the status of Tibet has created its own dynamic: the Dalai Lama's own followers and activists around the world look to the spiritual leader to keep pushing the Tibetan cause. 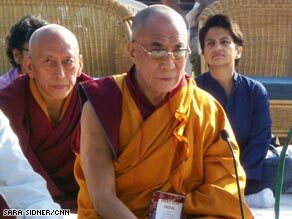 China has long accused the Dalai Lama of orchestrating political maneuvers against China from his post in India. They blame him for inciting violence in the most recent uprising in the Tibetan region in March 2008. The Dalai Lama fervently denies the allegations and says he is interested only in exploring wider autonomy for Tibetans in China. His envoys have held talks with Chinese representatives, but the status of their homeland remains in dispute. The Dalai Lama and his followers walk a fine line between religion and politics in India, which is also home away from home. On the 50th anniversary of his stay here, the Dalai Lama traveled to eight places of worship around New Delhi, paying tribute to the religious diversity of his host country and the welcome he's been given by the Indian government and people. "Naturally, sometimes (a) little disagreement may come but (it) doesn't matter because there is basic trust," the Dalai Lama said. "And spiritually we consider Indians our guru, our teacher, because we are Buddhists. Buddhism comes from India. So therefore spiritually we are very close to this country. "